I recently had the opportunity to review a pattern for a Ruffled Bolero. If you're not sure what that is, it's a super cute half jacket with tons of ruffles. I decided to pair it with another pattern that I had tested from the same company, Whimsy Couture Pattern Shop. You can see the Strappy dress here. The motorcycle was out while we were taking pics so we thought it would be a fun prop for the pics. I think the outfit turned out very Jackie O. What do you think? Now for the super cute picture overload. I even made a matching flower bow with the left over ruffle. I plan on doing a tutorial about it soon. If you love these patterns too you should stop over at the Whimsy Couture pattern shop. I absolutely love this, and she wears it very well. Love the fabric colors too. How cute!!! 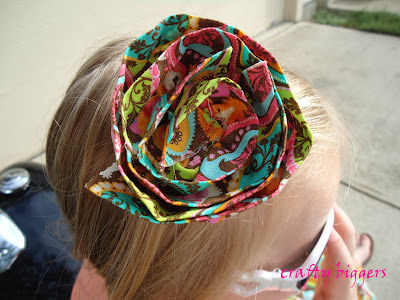 I can't wait to get good enough at sewing to make my daughter something as cute as this. Thanks for sharing!!! Thanks! 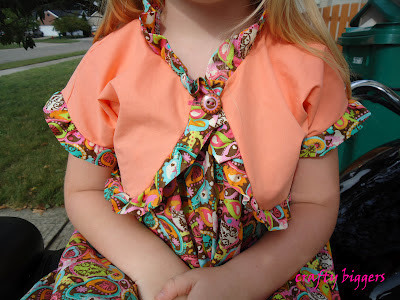 Honestly if you can sew at all I would recommend Whimsy Couture patterns. 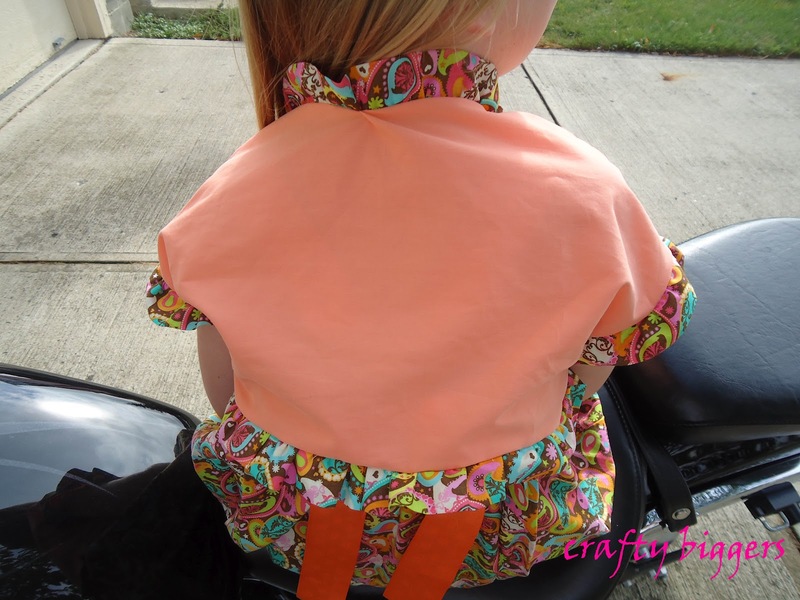 They are super easy to sew and the instruction are great. I love the shades on the model:) and what a bike! What a great idea. I came over from Michelle's Tasty Creations. I'm excited to see more of your projects! Cute!! I like the hairbow too!! 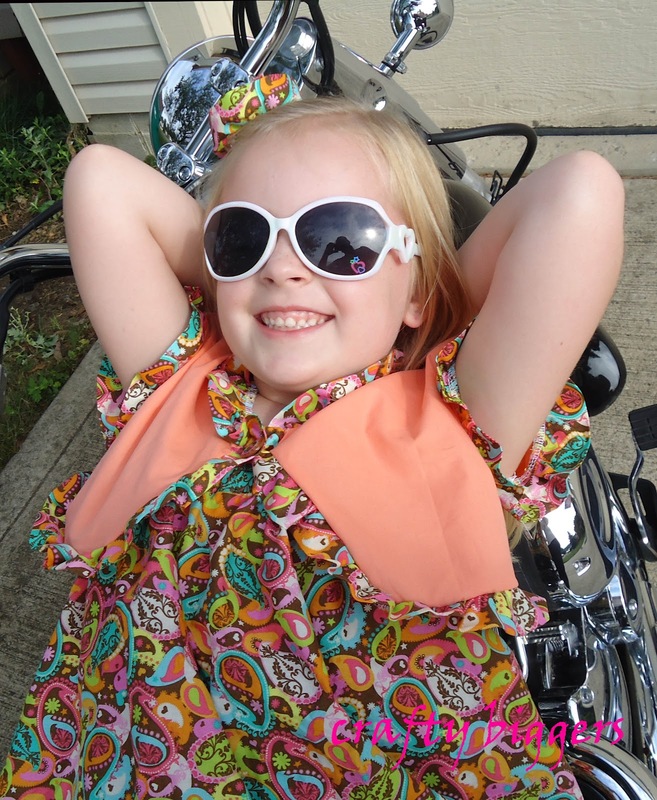 Just visiting from the weekend wonders blog hop! OMG that is gorgeous! I love how you posed her on a motorcycle, hehe. So cute! Thanks for sharing at Hookin On Hump Day! Too cute! Thanks so much for linking up last week to Creative Thursday. Can’t wait to see what you have for this week’s party! Have a great week. Thanks! I wish I had more of these fabrics because I'm in love with the color combination too!